Know exactly what goes into your meat and make delicious, DIY wild game jerky like a pro with Valley Sportsman Custom Mixed Seasoning. Contains enough seasoning to flavor up to 15 lbs. of meat. Includes resealable cure bag. 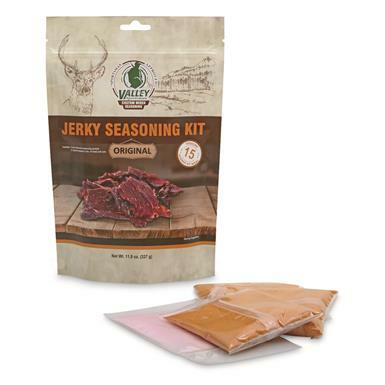 Valley Sportsman Original Jerky Seasoning Kit is rated 5.0 out of 5 by 1. Rated 5 out of 5 by JerkyLova from Tasty and easy to make! This jerky making kit is easy to follow and the flavors are amazing! I love that the packets come in 5 lb increments so I don't have to mix up a big batch at once. We like to make our jerky in smaller batches because of the size of our dehydrator. I will need to upgrade our dehydrator soon after how good this stuff tastes! Definetly recommend.